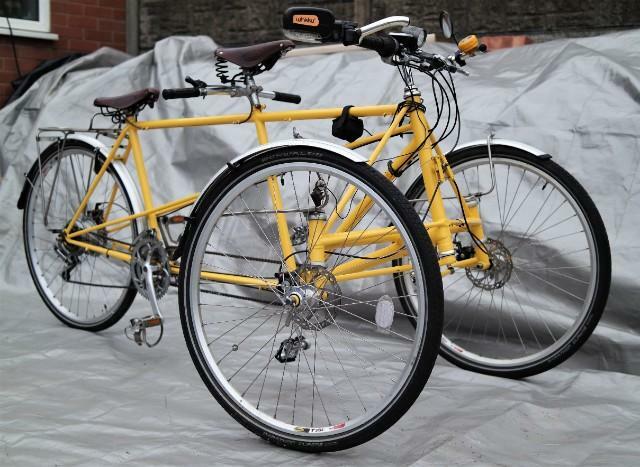 Originally a Silver race-tourer, this tandem was used for decades to help my partiallyisighted wife enjoy the open road. Age and infirmity has taken the joy away so we looking for it to go to a good home where it will be appreciated. Converted to a Trike by Austin of 'Roman Roads' after I lost my balance following a heart attack, it has been used for shopping etc until I got my driving licence back. It has a NuVinci rear hub and a triple-chainring conversion giving 3 infinite ratios. Good quality cable-operated disc brakes and a single rear vee-brake for 'parking' It also has a locking front lever for a main parking brake. Front pedals are equipped for clipless use. Rear pedals have the original toeclip pedals. It had a pair of 'Winkuu' rear-view mirrors/direction falshers but the LH one got broken. Front light is a very bright LED type with a fresnel lens addition giving a wide flat beam. Austin included a rear luggage rack which will have a Carradice canvas set of panniers and saddlebag. A fairly new pair of Brookes leather saddles are fitted with a ladies version for the stoker. Also please note the mudguards to reduce spray and protect the stoker from additional spray off the front wheels!